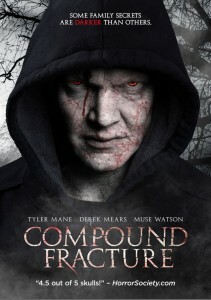 Level 33 Entertainment is handling the May 13th DVD and VOD release of Compound Fracture. Tyler Mane, Derek Mears and Muse Watson – horror's physically intimidating genre vets – star in this supernatural thriller that was produced by Mane. Directed by Anthony Rickert-Epstein, the film is about a broken family with a history of abuse and dementia that is forced to find a common ground to fight a greater supernatural threat. Leslie Easterbrook, Renae Geerlings, Daniel Roebuck, Todd Farmer, Jelly Howie and Alex Saxon also star. Prior to its home entertainment release, COMPOUND FRACTURE enjoyed a successful limited theatrical release and film festival run across the United States and Canada, receiving glowing reviews and winning “Best of Festival” at the Hot Springs Horror Film Festival.